Snorkel gear, snorkel vests, and or \"Noodles\"
This beautiful 38ft catamaran is offered for private sailing charters and snorkeling trips. Your charter will be tailored to your specified needs at very competitive prices. Visit Grand Cayman’s Famous Stingray City Sand Bar, Stingray City Dive Site, Rum Point, Starfish Point, Camana Bay and Seven Mile Beach. As their guest you will enjoy sailing, snorkeling, scuba diving on the 38? Prout Catamaran “Be Happy” skippered by a U.S. Coast Guard Captain Ben. Be Happy” is a classic 80’s catamaran Built for comfort and speed sails up 10 knots with the Cayman trade winds. Fully Equipped for a fun day on the water; on board you will find a stereo, snorkeling gear, fresh water shower, large ice chest, marine toilet, and much more! with lots of space to move around and plenty of places to sit, let ” Be Happy” show you a great time on the water! Join in and learn how to sail or sit back and relax, either way you are going to have a really good time on board this lovely vessel. There is so much to take pleasure in and relax on your private sailing trip in and around Cayman. Savor the peaceful sound of the wind on the sails, the water lapping – relax and unwind. Half or full day Sailing charter. The sea is your playground for the day. 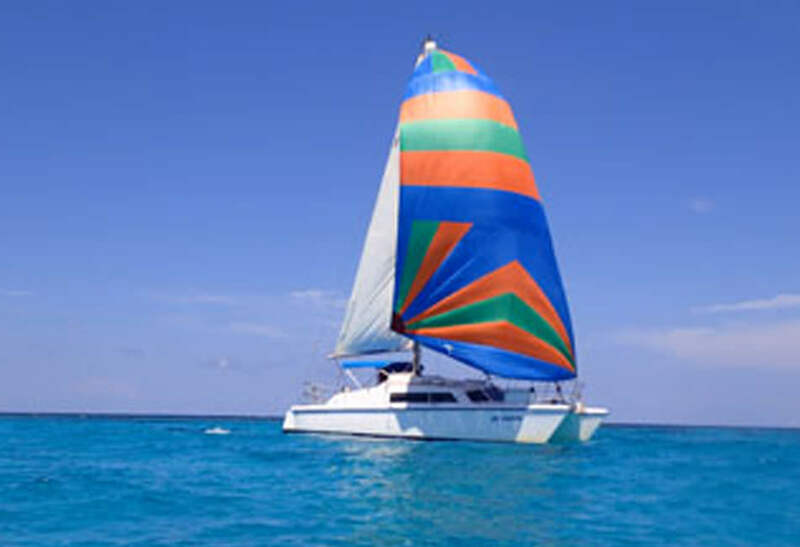 If you are looking for the perfect day on the water then book a half or full day charter aboard this sailing catamaran and explore the island. Visit the stingrays, play volleyball at Rum Point, snorkel the reef or checkout the mangroves. The half day charter is four hours and the full day charter is about 7 hours. Sunset Sailing on the Caribbean Sea is the perfect end of a day. Sit back, relax and enjoy this 2.5 hour sunset cruise around the calm waters of the North Sound Lagoon. Light snacks, fresh fruit and water are included. Feel free to bring anything stronger with you on board. Located on the picturesque North Side of Grand Cayman, the shallow and clear waters of Rum Point Beach make it the ideal beach for swimming and offer some the finest snorkeling in the Caribbean. Kaibo is located near Grand Cayman’s Rum Point. Kaibo is completely removed from full scale development. Savor the delicious food at two restaurants, while sitting on the beach…relax and unwind.